My weekend, well Saturday, was spent catching up and hitting deadlines for the two online bees I am participating in. First off, I finally finished the first of two blocks for my March Scrap-bee-licious bee. My stash bee blocks for April are completed. I did an angel block this month as well. I am at an interesting point with my participation in bees. I joined both the bees I am in, for two different reasons. The Scrap-bee-licious bee is for friendship, as it is made of some of the US-based bloggers that participated in Plum and June’s New Blogger Let’s get acquainted blog hop. I do like the camaraderie of this bee!! Everyone is fantastic. The other one, Stash bee, I joined to get new skills and see what blocks are added each month. However, I was so frustrated and a little disgruntled this weekend – I did not want to spend my Saturday making these blocks. I have so many other projects, I wanted to spend time on MY projects. I know I should not have left them to the last minute – but that’s me too :-). Do you all feel like that? How do you balance the commitments of a bee with your other stuff? Anyway, our guild had a bee today, the kind which is more of a free sew….I decided to reward myself and sew something I wanted to sew. No deadlines. No expectations. I was much happier!! 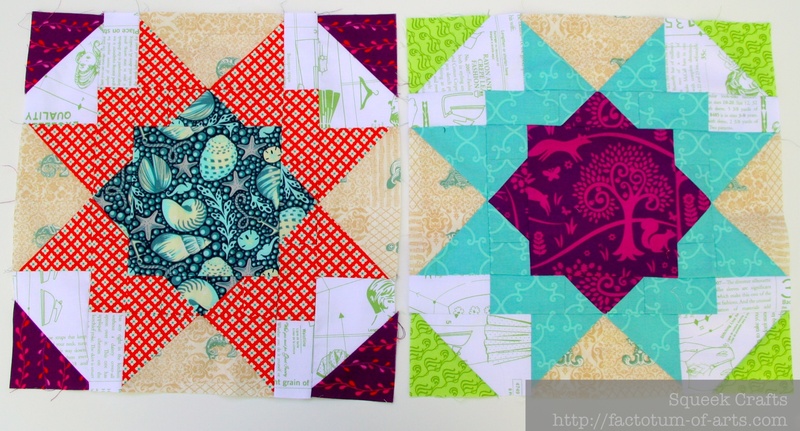 I am linking up with Alyce over @ Blossom Heart Quilts for Sew Cute Tuesday and Lorna over at Sew Fresh Quilts for Let’s bee social (see buttons on the right). 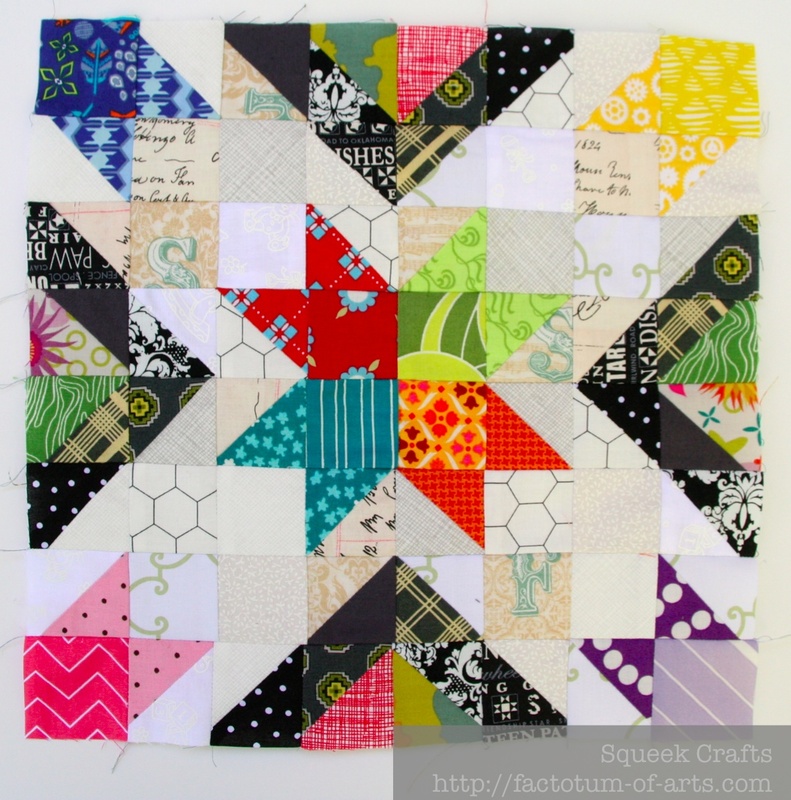 This entry was posted in Uncategorized and tagged Bee Blocks, Scrap-bee-licious, Stash Bee on April 28, 2014 by mlwilkie. I generally don’t join bees for precisely the reasons you’ve given above. Either the design doesn’t interest me, or I have something else that I want to work on. I’m not really a block-based quilter on the whole, so the whole bee thing doesn’t work so well for me. However, I do enjoy observing the work of others who do participate! whoa! That’s a pretty awesome block you have there! I usually only do bee stuff it is very open or limited to a small time investment. I am so bogged down mentally with sewing commitments that I haven’t sewn anything in DAYS. Ugh, I just have no sewjo…and only two days left in the month! Poo. Anyway, your blocks turned out lovely, I’m sure your bee mates will be delighted with them. I totally get like that with sewing commitments, too. I try to just go with what inspires me at the time, deadlines be damned. And somehow I usually end up getting stuff done. 😛 Your blocks look beautiful. I love the variety of fabrics you used! I try and do my “commitment” sewing asap. When I get instructions for a bee block or for a QAL I’ll try and do it within the first few days (eg I plan on working on the May Gypsy Wife blocks this weekend). This way I get the over and done with and don’t have to stress and worry about doing them for the rest of the month and having those thoughts bog down my fun sewing. I have not ever joined in a bee. It all sounds like fun…. But thank you for sharing your views on that green grass from your side of the fence, Michelle! Your blocks look awesome, by the way! I really like the first block. I would like to be in THAT bee. Iam in a little over my head, too. I let slip most of the Block of the Month I was in last year, and some of one bee. I decided NOT to do a block of the month and have done well with the friendship bee but the applique bee has just started up and I missed the first meeting! I am already a project behind! Oh, by the way, what is an angel block? I spent a year in do.good Stitches- to try new skills and meet new people- but found at the end of the year I was resenting the time it was taking for me to complete projects (I just don’t get a ton of sewing time to begin with…) Also, I found I didn’t always have the “right” types of fabric in my stash, and I’d have to scramble or spend $$ (which I also don’t have much of…) When I realized I was resenting instead of enjoying my time, I stepped down and gave up my spot. I haven’t done any other bees, but I did try a round robin once and felt the same way. Not to mention the pressure of getting someone else’s project just right- I can live with imperfection on my own projects, but set a much higher standard for others. I appreciate you writing candidly about bee participation- I always feel guilty that I don’t enjoy it more! They look fantastic. Great job. What’s that purple fabric with the tree and the fox (the right side stash bee blocks) it’s a pretty cool color combination. Very pretty blocks. Looks like you are having fun and enjoying this. Everyone’s comments resound with me also. I belong to a group that loves to enter contests and shows and is always trying to get me to do so as well. I’m not biting! I have found those turn into commitments and they stop me dead in my tracks. I “have” to work on projects I chose as I choose them whether for a graduation or a new baby or whatever, dates do not apply. I hope getting caught up takes a burden away. Your blocks are wonderful if that makes you feel any better! I believe you made the angel block this month so I wouldn’t have to make the block! Thank you! I was just saying the same things to my husband last night. I don’t have a lot of spare time, with two little kids and when I do, it would be nice to sew for myself. Oops…my mistake. I would back out now if I could though!